If you’re planning to collect some Starbucks stickers this holiday season so you can claim a Starbucks 2012 Planner, then better get your taste buds ready for these holiday drinks. 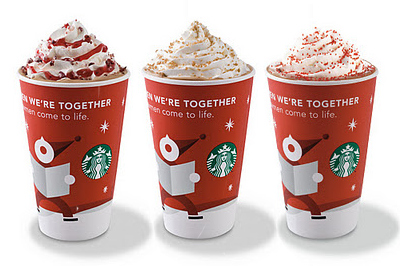 Starbucks will feature two familiar Christmas drinks, the Toffee Nut Latte and the Peppermint Mocha; and a new one called the Cranberry White Chocolate Mocha as their 2012 Christmas Beverages. The left-most drink is the Cranberry White Chocolate Mocha. It’s made from Starbucks’ signature espresso, combined with freshly steamed milk and white chocolate then topped with whipped cream, a tart cranberry drizzle and crystallized cranberry sugar. Coming back from previous years, and in the middle, is the buttery-sweet Toffee Nut Latte while the right-most drink is my favorite from last year, the Peppermint Mocha. I’m excited to try the Cranberry White Chocolate Mocha. I’d like to find out if it can replace my all-time favorite Starbucks Christmas Beverage, the Dark Cherry Mocha which they served a couple of years ago. i really love mocha at starbucks! !